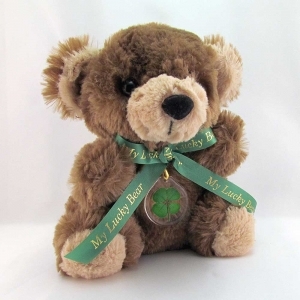 This cute mini Lucky Teddy Bear may be small in stature but is big on luck. He doesn't need to stay at home, you can take him and good luck with you. A great gift for any Bingo, Slots or Gaming player, a St. Patrick's Day gift or a good luck gesture for anyone. This chocolate brown bear is wearing a real genuine preserved four-leaf clover acrylic charm pendant and "My Lucky Bear" scarf ribbon and bow. Gift boxed with a clover fact sheet. Bear seated is 6.5 inches tall. Leaves symbolize Faith, Hope, Love and Luck!